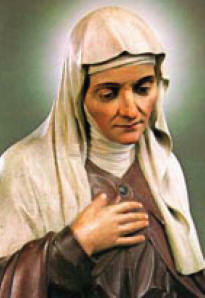 Saint Angela belonged to the Middle Ages. She was born in 1474 at Merici, a town on the shores of a lake in Northern Italy. At the age of 10 her father and mother died. A kind uncle took care of her and her elder sister. They have been taught the Truths about the Faith by the parents, who were God fearing people. Their uncle loved the girls because they were really good. When Angela grew up, she was surprised that very few of the children, living near her in the town, knew anything at all about God or their religion. “But it’s terrible”, she said to some friends, who had come to have tea with her one day. She said,”We were taught all this when we were tiny little girls and these girls are quite big. Some of them have never even heard of God”. The friends were also concerned about this. After they had gone home, Angela went out for a walk by herself to think out a plan of what she could do about the town children. As she walked through a grass field, she saw an extra ordinary vision. She saw a wide golden ladder like stairs sticking straight out of the field high up into the blue sky; and up the ladder were going all sorts of girls, tall and short, old and young, dark and fair, fat and thin, rich and poor but they were all laughing and singing as they hurried up the ladder. And as she stood staring at this wonderful sight, she heard someone say, “Angela, these are all your girls that you are going to teach to help them live happily on earth and be the citizens of heaven till eternity.” Angela was so interested, that the very day she visited her friends. They decided to collect the little girls that played in the street and teach them in “Home - Made Schools”. They were not real schools, of course, because each friend took a few girls to their home and taught them there; one taught history, one arithmetic, one geography and all that, but they all taught Catechism (Truths about the Faith). When they had finished in the morning, the friends visited hospitals and prisons to find girls and they taught them too. She looked and looked, and listened eagerly to the Divine voice. So Angela went to Rome and told The Pope about the vision. She spoke to him of her educational plan for girls whom she considered as “The Nation’s Future Mothers”. He blessed her undertaking and encouraged her efforts. However there were many obstacles that came her way namely, the political conditions of the time, a war, and sickness which delayed the realization of her dream. Only in 1535, Angela De Merici was able to make her first formal foundation at Brescia with twelve ladies. Amazingly, within the month, the number grew to seventy two. They devoted their lives to the education of young girls. Far in advance of her time in the matter of school management, St. Angela’s “Holy Company” was the Catholic Church’s first order, specially devoted to Teaching. She chose the name Ursulines for the Holy Company, in admiration of her favourite Saint Ursula of the Third Century. They also visited hospitals and prisons to share God’s Light, Love and Life with the inmates. Though Angela De Merici lived only five years more after the establishment of her order, yet the impact of her deep desire for the development of growing girls through good education has had rich dividends for more than four and a half centuries. And we at St. Angela’s Jaipur, are among the millions of beneficiaries who have experienced the Blessings of her Patronage for eighty five years. Hail, St. Angela, Hail! The Catholic Church remembers St. Angela on January 27, every year on her Feast Day. Adapted from “Sixty Saints for Girls” by Joan Windham and the Saint Companions for each Day.